Touristplacesinindia offers complete information on the city of Haridwar, Temples in Haridwar, Haridwar tourism, Hotels in Haridwar, Haridwar Tour Packages, Tour to Haridwar, Travel Packages for Haridwar, Tourism in Haridwar, Haridwar tour. 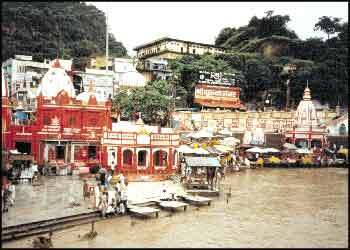 One of the holiest cities along the banks of the Ganges, Haridwar associates a lot of significance to Indian mythology. Legend has it that in the Vanaparva section of the Mahabharata, sage Dhaumya mentions Haridwar and Kankhal while speaking to Yudhisthira about the tirthas of India, Gangadwar. One of the Char Dhams (the four main centers of pilgrimage in Uttarakhand namely, Badrinath, Kedarnath, Gangotri, and Yamunotri), the city of Haridwar came under the reign of the Maurya Empire (322�185 BC), and later under the Kushan Empire (1st�3rd centuries). One of the favorite tourist destinations in India for pilgrims and travelers alike, Haridwar offers several options. Located to the north of the center, Hari-ki-Pairi (or Har-ki-Pairi) is considered to be the city�s focal point, where devotees assemble for a holy dip in the Ganges. Legend says that this is where a drop of nectar fell as a result of the manthan - churning of the oceans � Mythologically it signifies the start of the world. At 8-9km from railway station, the Chandidevi Mandir, is another of the wonderful tourist attractions in Haridwar atop the �Neel Parvat� on the eastern bank of river Ganga. Built in 1929 A.D. by the king of Kashmir, Suchat Singh, it is dedicated to Goddess Chandi. A city famous for the Kumbh Mela, Haridwar can be easily reached by air, train or bus. Dehradun�s Jolly Grant airport, that offers daily service twice a week to Delhi on Air Deccan, is located 20 km from Haridwar. Once you are in this sacred city of India, you will have no problems in lodging into any of the hotels in Haridwar that come in various categories and prices to suit your needs. Log on to www.touristplacesinindia.com which gives online information about Haridwar, the tourist attractions on your tour to Haridwar, booking for India travel tours, and tour packages on your tour to India.